ATi's Radeon 9000/9000 Pro was never really received that well since it was basically a cut down version of the 8500 core. 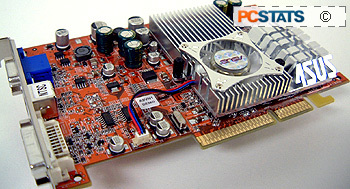 The Radeon 9500/9500 Pro came next, and that VPU offered excellent value. Though as it was based on the same R300 core as the 9700 Pro, it wasn't very cost effective to keep producing them. Eventually ATi released the Radeon 9600 Pro, and since is' core is built using 0.13 micron manufacturing, it is also inexpensive to produce. With the release of the GeForceFX 5700 Ultra GPU, ATi simply raised the core speed of the Radeon 9600 Pro to 500 MHz, gave it a new name, and thus, the Radeon A9600XT was born. 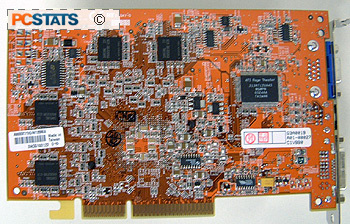 Asus has been a supplier of nVIDIA based videocards for as long as I can remember... there were a few SiS cards here and there, but Asus has generally only been nVIDIA-only when it comes to videocards. With nVIDIA behind the eight ball for so long, consumer demand dictated that ATi-based Asus videocards would have to come out sooner or later. I suppose this is a sign of the times, as many other tier one manufacturers have also indicated they are adopting ATi GPUs into their previously nVidia-only videocard inventories. 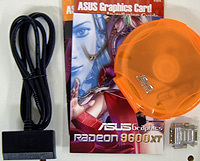 Asus' mainstream Radeon A9600XT comes packing 128MB of Samsung memory, and includes a DVI connector and DVI-to-analog converter. These little DVI-to-analog converters always come in handy, especially if you want to configure dual analog monitors. If you've ever wanted to connect the PC to a Television, you'll be happy to know the Asus Radeon A9600XT videocard is also fully VIVO compatible! The software package that comes with the Asus Radeon A9600XT is also quite impressive, including; PowerDirector, AsusDVD, Ulead Cool 3D, UleadExpress SE 4.0, Asus Medi@ Show SE 2.0, a six game demo CD and two full versions games (Battle Engine Aquaila and Gun Metal). Oh, I almost forgot to mention that the Asus Radeon A9600XT also comes with a Half Life 2 coupon that will allow you to download the full game via ATi's website when it's released! Not too shabby at all!